How does the generator process the rules? Can I have more generators for a single language? Can I have multiple mapping configurations per generator? How to generate multiple targets from single source? What macros are available in the templates? Where shall I put utility classes? Where shall I put runtime classes? How do I generate unique names? How to generate enumeration datatypes? How to I change packages of the generated Java classes? What is the difference between root mapping rules and reduction rules? What happens to untransformed roots? How to generate multiple nodes for a single node? Why is editing the macros so weird? How can I generate root nodes for non-root nodes? How to remove no-longer needed roots from the model? How do I generate nodes for nodes in accessory models? How to use mapping labels? How to handle references during generation? Can I debug the generation process? How do I figure out the actual generation steps? Can I specify the order in which generators should be run? How to check that the model has no errors before starting the generator? How to extend an existing generator? How to build an extensible generator? What shall I use TextGen for? How to generate multiple files per root node? The template-based model transformation phase consists of one or more micro-steps. A micro-step is a single-pass model transformation of and input model into a transient (output) model. The generator during a generation step will iterate over the model and search in the generators of all languages involved in this step for rules applicable to the nodes in the input model. When no applicable rules are found, the generation step stops. The next generation step (if any) will receive the output model of previous generation step as its input. You can check out full description of the generator algorithm in the generator documentation. No, MPS only allows one generator per language at the moment. If you need several generators for a language, it is advisable to create empty languages that extend your language and in each of these extending languages to define the desired alternative generators. Yes, they will all be treated as equal during the generation process. Additionally, each mapping configuration can have its generation process priority specified separately, which gives you more flexibility to tune the generation. Have no generator in you language directly and provide generators for each target platform in a separate empty language, which extends the original language. The developer will select the desired target platform by importing the appropriate extension language. Create a new model inside the generator. Make sure it does not have the generator stereotype attached to it. 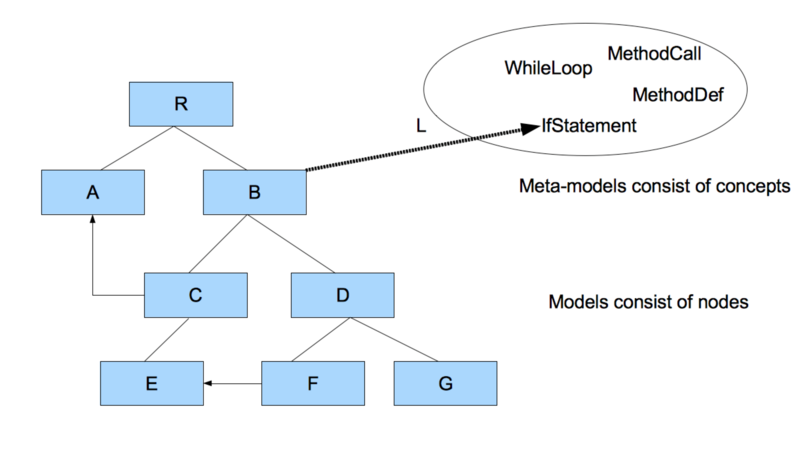 The model should typically depend on BaseLanguage so that you can create classes in it. The original generator model should then import the utility model. context node - If specified, then MPS tries its best to generated names 'contained' in a scope (usually a root node). Then when names are re-calculated (due to changes in input model or in generator model), this won't affect other names outside the scope. The context node parameter is optional, though we recommend to specify it to guarantee generation stability. The uniqueness of generated names is secured throughout the whole generation session. Having to reduce an enumeration datatype into a Java enum, using the $SWITCH$ macro is usually the best option. During generation models, which have the form of a tree (Abstract Syntax Tree, see 基本的な考え方 ), are translated into the generated models, which are also trees. Typically root nodes are generated into root nodes (e.g. a robot スクリプト into a Java class) and non-root nodes into non-root nodes (e.g. a robot ステップ command into a Java ブロックステートメント ). Thus templates for root mapping rules represent a starting point of the generated model and cannot specify template context, unlike reduction templates, which may hold context and indicate the actual generation contents with the template fragment marks. Nodes of rootable concepts, when positioned in a non-root location, will have reduction rules applied to them. Root mapping rules are only applied to nodes in root positions. Roots, for which there are no applicable transformation rules, are carried unchanged over to the next generation step. A template fragment in a template indicates, which node will be replacing the current input node. A template fragment can only be attached to a single node inside the template, but a generator template can contain multiple template fragments, provided the are all attached to nodes in the same role under the same parent. This way multiple nodes can be generated for a single input node. Indeed, the generator macros and template fragment marks are a bit rough to edit at first. But once you understand the underlying principles of how they work, you'll be able to use them efficiently. The macros have been implemented as Node/property/reference attributes (see the 属性 section of the 構造 chapter). As such, they can be used in any language and do not require any up-front support to be available in that language. This is important, because any language can be used as a generation target in MPS. Macros are thus attributes attached to the node that they wrap. Deleting or replacing the node wrapped by a macro will delete the macro as well and you have to re-enter the macro to attach it to a new node. A recommended approach is to enter the code for the template first and then start adding macros. If you need to change the node wrapped by a macro, you can at least preserve the インスペクター window contents on the macro on the old node by copy-pasting it into the macro on the new node. 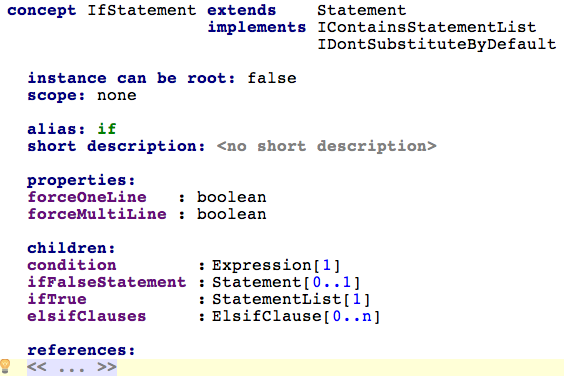 Simply create a root mapping rule for the concept, perhaps further restrict it with a condition. The rule is called root, because it generates a root node, not necessarily that it takes a root as input. Alternatively you can either use conditional root rules, which insert root nodes based on evaluating a boolean predicate, or with pre-processing scripts , which can inspect the input model and create root nodes as needed. Root nodes are removed automatically once they have been transformed using root mapping rules. For roots that are not directly transformed use the abandon root rule to prevent them from being propagated into the next generation step. Reduction rules can then be used to further generate the "inserted nodes" into the desired target language. Mapping labels are defined in mapping configurations (e.g. main). They must then be populated by wrapping the node that you want to be stored with macros, such as $LOOP$, $LABEL$, $COPY_SRC$ and others. Mapping labels serve as dictionaries, which store nodes as keys and whatever they have been generated into as values - N -> G(N) in our example here. The generator has to be instructed explicitly to store the mapping between a node and its generated node into a mapping label. Template fragments as well as node macros allow the user to specify a mapping label into which the generated node should be saved. When reducing R into G(R) , a reference macro on G(R) can retrieve G(N) from the mapping label using N as a key when calling the generator context in genContext.get output by label and input . Chapter 7 of the generator tutorial covers mapping labels in more detail. The saved transient models allow you to investigate how the models looked like at various stages of the generation process. The second option is using the Generator Tracer Tool . For this tool the "Save transient models" option also has to be set to on. The Generator Tracer Tool gives you the ability to investigate in detail the generation process for a selected node. When you select a node in your original model or in any of the transient ones, the context menu gives you the options to either trace the generation process forward or backward. As a result you get a tree-shaped report giving you access to all the stages, through which the particular node went during generation and the rules that influence its generation. Use the Show Generation Plan action from the generator context menu. This will give a detailed report showing all the planned generation phases and listing the mapping configurations run in each phase. The Generator priorities tab in the generator's Module properties dialog enables you to specify ordering rules between two distinct mappings configurations. For more complex scenarios, the new functionality of Generation plans gives you full control over the generator process. Run the Check model (language/solution) context-menu action on the model/language/solution to check. The Preferences -> Build, Execution, Deployment -> Generator -> Check models for errors before generation configuration flag specifies whether the model checker should be run automatically each time the generator is triggered. There is one rule to follow - make sure your extending generator is run before the extended one - give it higher priority in the generator order priority dialog. By extending the generator, extensions can alter the semantics of the original language. The MPS generator is extensible by design – it resolves all generator rules and mapping configurations from all involved languages and builds a global generation plan. Any language that is attached to the project will have its rules included. The plan specifies the execution order for the generator rules based on their mutual relative priorities expressed in mapping configurations. This enables language extensions to inject their own desired generation rules into the most suitable generation phase. Since priorities are expressed as a collection of relative ordering between mapping configurations, a language extension does not need to know about all other generators involved in generation in order to work. Potential (and rare) clashes are detected and left up to the developer to resolve. Once created, the generation plan is used to iteratively invoke the generators, potentially leveraging parallelism of the underlying hardware for mutually independent rules. Providing additional reduction rules is one way to extend a language. Using a Generator Switch is another option. If the parent language uses a generator switch to choose the right reduction rules, the language extension may extend that generator switch with its additional logic for picking the reduction rules – typically to include new rules contributed by extension languages. While the generator performs model-to-model transformations, TextGen does mapping to text. This is typically the last step in generation and is fully managed by the generator. Roots are picked by the generator and converted to files. The TextGen intentionally offers very little flexibility to the language designer. It is the Generator, where the generation process should primarily be configured and handled. If you feel a need to workaround the limitations of TextGen, you're most likely trying things the wrong way. Generator is the place where you have the most flexibility. TextGen only allows one file per root node. Also, you can only have one TextGen component per concept. The flexibility should be encoded into the generator, instead. You get the generator create multiple copies of the node, maybe wrapping each of them in a new node of different concepts. These new nodes then have their TextDef defined to perform the desired model-to-file conversions.